Series DL Tubular Process Air Duct Heaters: stainless steel elements, stainless steel element support, painted steel support rods & flange, NEMA 1 terminal enclosure, and replaceable element design. Operates at a low temperature up to about 500°F. Series DM Tubular Process Air Duct Heaters: Incoloy 840 elements, stainless steel element support, stainless steel support rods, painted flange, NEMA 1 terminal enclosure, and replaceable element design. Ability to operate at a moderate temperature to about 750°F. Series DH Tubular Process Air Duct Heaters: Incoloy 840 elements, stainless steel element support, stainless steel support rods, 3-1/2″ high temperature insulation below flange, NEMA 1 terminal enclosure, and replaceable element design. It can operate at a high temperature to about 1200°F maximum. Series ILD In Line Tubular Process Air Duct Heaters: Incoloy 840 elements, painted steel frame, NEMA 1 terminal enclosure, and replaceable element design. 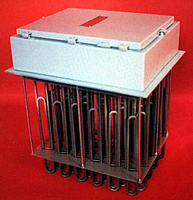 Process air duct heaters may be suitable for your industrial needs! To speak with an AccuTherm representative please visit www.accutherm.com.